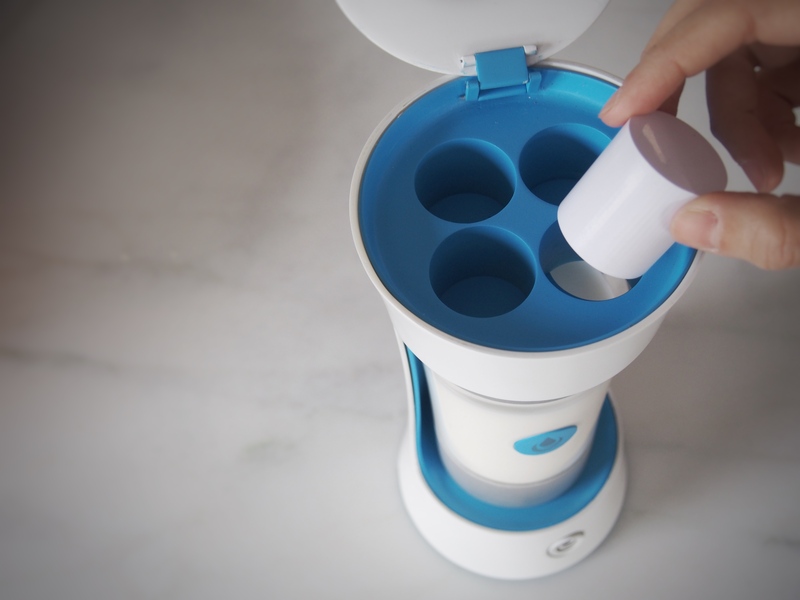 The Yomee is a new gadget on Kickstarter designed to make you yogurt. It’s essentially an automated milk heating and cooling system that also happens to rely on pods. Pods! As you can always expect from a proprietary pod-related gadget, the device relies on individual yogurt culture packs that you can only buy from Yomee. The pods themselves don’t have a barcode or even wrapping. They’re just dusty compressed milk and yogurt culture in the shape of a pod. You can buy yogurt culture on the internet, but it comes as a straight powder. Because the culture has to be added at a specific temperature, Yomee says the pod form factor is important. The machine knows to release the pod at the right time. If you just poured powder into the machine, it would fall through immediately because there’s an opening for the pod that gets bigger at the right time. The machine was clearly designed so culture powder wouldn’t work, but that’s typically the case with all pod products. Pods are a great way to monetize a gadget, unless your device doesn’t actually do anything. The Yomee heats your milk (which can also be dairy free), drops the culture, and then incubates the yogurt and cools it. The whole process takes six hours, but the idea is that you set Yomee up overnight and can grab your yogurt in the morning. If you’re prone to random yogurt cravings, then I don’t think the pods are for you. Stick with grocery store yogurt. The Yomee comes with a companion iOS / Android app that lets you select what type of yogurt you want to make, including Greek, plain, or stirred. This is just a plastic stand-in for the real yogurt pod. Co-founder and CEO Ashok Jaiswal brought the Yomee into The Verge‘s office this past week. Unfortunately, the machine was missing a power supply or something, so I couldn’t actually taste-test the yogurt. (Our meeting wasn’t going to last six hours anyway.) I wish I could tell you if it’s good. Jaiswal also told me that for now, all the yogurt will be plain, although he thinks flavors will be added as a stretch goal on Kickstarter. Jaiswal also explained why he felt this device needed to be made. He told me about how, in India, his mom has made yogurt at home for decades, and he wanted to make some for his kids who are being raised in Hong Kong. Only when he tried to make it himself did he discover it’s kind of a mess. The process isn’t necessarily complicated, but it could be easier, so he created Yomee. The product is advertised as a gadget for people who care about what they eat, including their choice of milk and preservatives. I think people who value control over their food probably already make their own yogurt, though, especially if they’re vegan. The company’s current goal is $28,000. The Yomee starts at $99 on Kickstarter, and the pods cost $0.99 each.